Will it require a subscription? No. TESO: Tamriel Unlimited went subscription-free on March 17, 2015. Elder Scrolls Online is now buy once and play forever. Is it Available on Consoles? Yes. 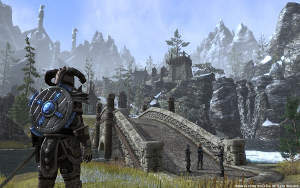 The Elder Scrolls Online became available to XBox One and PS4 consoles on June 8, 2015. 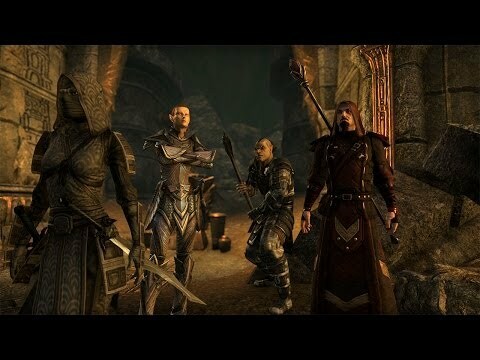 Where Can I Buy Elder Scrolls Online? Here are quick links to Amazon Digital Imperial Edition (PC only), and Standard Edition (all platforms), or you can get it right from Zenimax Online Studios. Combat in ESO will be familiar to those who have played any of the previous titles: left-click to attack, left-click and hold to power up an attack, right-click to block, sneaking, dodging, etc., will all be in the game. Bethesda has created a technology in which all players share one single server called a mega-server. This means that finding your friends, guildies, etc., will never be a problem because they are all on the same server as you. The mega-server is smart enough to place you all in an area with room for you to adventure together. One of the best features of all Elder Scrolls games is the ability to customize your character in almost any way that you like. That has not changed in The Elder Scrolls Online. There are nine races to choose from, with customizable body and facial features, but here's the best part: any race and class can use whatever weapons and armor they like! We're talking tanks with bows, stealthy healers, two-hander weilding casters... the sky is the limit! Zenimax Studios has also made available the "Imperial Edition" of the game. This special collector's edition of the game costs an extra $20.00, and one of the perks that it includes is the ability to play the Imperial race in any of the factions. Okay, What About the Vampires and Werewolves? The answer is yes! You are able to become a vampire or werewolf in ESO! Through a system with the familiar moniker of perks, you will be able to not only transform, but you will be able to highly customize traits of your character such as how stamina is regained. 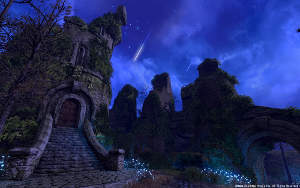 As with all games by Bethesda, The Elder Scrolls Online approaches questing through exploration. As you wander the world, the compass on your map will indicate points of interest, and you can choose whether to go there and check things out. However, on the way there you might see a cave or some other thing that you want to see, and that could take you down a whole other quest-line. As with other Elder Scrolls titles, talking to random NPC's can also end up starting a quest or revealing a location on your map where a quest can be found. In terms of the number of quests available, there are reportedly more than 1000 quests in ESO. Even better is how questing is approached in The Elder Scrolls Online--there's almost never a "go kill x number of y" type of quest. Every quest has depth to it, and often quests require you to make a moral decision in order to continue through them. The game really opens up at level 50, which is when you may decide to PVP, or get into more challenging content. The more challenging content is found as you are guided to heroic adventure areas. Here you can still continue solo play, but small party and large group content is also available. Rather than describing character progression here, watch this video to have one of the TESO developers tell you how it works. 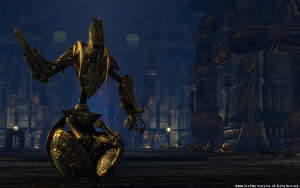 More information on The Elder Scrolls Online PVP can be found in the PVP section.